The delivery of Training & Technical Assistance (T/TA) is invaluable to organizations providing primary health care services to a diverse AA&NHPI population. 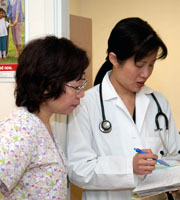 Organizations may not have the skills and knowledge required to provide health care services to an extremely diverse Asian American, Native Hawaiian, and Pacific Islander (AA&NHPI) population. Many organizations require assistance and resources that they do not possess internally. Utilizing its network of member community health centers and national partners, AAPCHO provides training and technical assistance to organizations so they may acquire the skills, knowledge, resources they need to provide culturally and linguistically appropriate health care services.